Catch all the updates from the match between Chennai and Mumbai. New Delhi: Hello and welcome to the zeenews.com updates. With India's T20 League going to begin from today, we will be providing you with important updates from the first game between MS Dhoni led Chennai and Rohit Sharma's Mumbai. For the starters, Mumbai won the league last year while Chennai are making a return to the league after a period of two years after having served a ban following the spot-fixing scandal. However, Chennai and Mumbai have played 22 matches against each other in the past and Mumbai won 12 while Chennai won 10 games. At the Wankhede Stadium also, the two teams have played 7 matches at the ground out of which Mumbai has won 5 while Chennai has won 2. Chennai skipper MS Dhoni is the most-experienced captain in T20 cricket having led in a total of 239 T20 matches so far. Mumbai captain Rohit Sharma has also had a steady role to play in the success of the team. Sharma has led Mumbai to win 3 titles so far. Interestingly, both the captains have played exactly the same number of matches in the League. In the previous 10 seasons, Mumbai have never had a good start, having lost opening matches in five seasons. Rohit and team will be desperate to alter this record on Saturday when they come to the field to play the opening fixture of the 2018 season. Chennai, on the other hand, would want to mark their return with an emphatic victory. Bravo the hope for Chennai. In the 16th over, the way he flat-batted Bumrah for a six through cover looked like he could still do something miraculous. But from the other end, he was facing disappointment. Mark Wood too lost his wicket in the next over as Hardik too picked his third wicket. Hardik finished his spell with figures of 4-0-24-3. 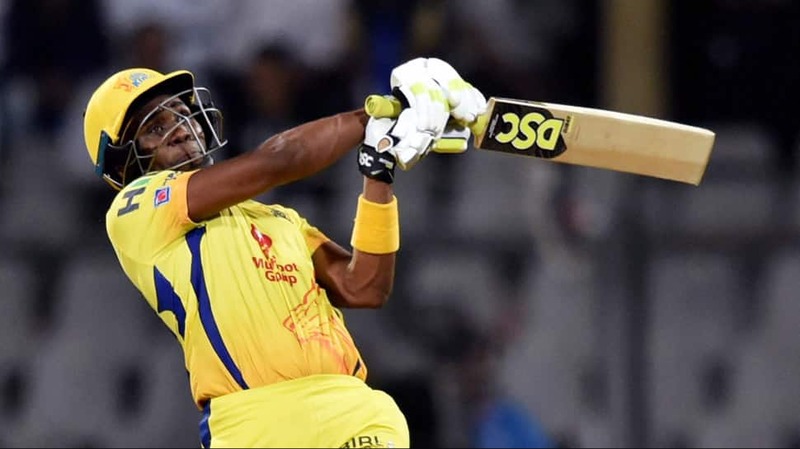 Facing McClenaghan, Bravo went berserk in the 18th over as he got two sixes in as many balls and brought the asking equation down to 34 in 15 balls. His first lifted the left-arm bowler over his head and then flicked through mid-wicket. Two balls later, he moved away and pulled it for a boundary. This was not over yet. Chennai needed 27 in 12. It was quite gettable. Bumrah came in and Bravo cleared his front foot and lifted it cleanly over cover for a six. Next ball, Bravo flicked a full toss for a six through mid-wicket. The match was on and Chennai could win this. 12 needed off 9. Gettable. Oh, it's all happening here. Bravo defends yorker and the ball goes back to hit the stumps. Bails did not get dislodged. Next up, he smashes a full toss for a six on the leg. The atmosphere was ecstatic. Oh No !!! Bravo goes. He should have finished the game but he is out. Out on 68 of 30. what an innings that was. Brought Chennai back from the brink of defeat. Chennai needed 7 off 6 with one wicket left. Injured Jadhav walked in. Played three dot balls and was waiting for a ball in his range. But Jadhav moves across and scoops Mustafiz for a six. Chennai needed one of 2. This went to the wire. And that was that. Jadhav plays a cover drive and finished it off. Chennai made a comeback with a bang. Bravo played like a champion. A true one for Chennai. Chennai stumbled in the chase by losing wickets at frequent intervals. Markande was hit for a six by Jadhav but you have to praise the youngster for showing a big heart. He hasn't shirked away from flighting the ball and that is what has done wonders for him. Has a high-arm action and that is the reason why he is able to disguise that googly of his brilliantly. If that is a plus, it is a negative as well. His stock ball doesn't spin much which has attracted the batters to have a go at them. Even if Chennai got 11 from his over, there was still a lot to be done. Then came Mustafiz with his cutters. He bowled the first two deliveries for ones but erred with his length the third ball. Jadeja latched on to the opportunity and hit it straight down the ground for four. But Mustafiz picked him on the last ball firing it wide with Jadeja scooping his shot in the air. Yadav completed the catch. Chennai once again lost a wicket just when a stand had begun to flourish. Markande returned for his final over and boy he was having a great night out there. Having got hit for a six again, this time by Dwayne Bravo, he foxed Deepak Chahar with a googly again. By the Chahar came in to bat after Jadhav walked off the field with a hamstring niggle. So Chahar stepped out early and was stumped. Markande certainly lived up to the expectations. Rohit Sharma was delighted seeing the youngster perform. Chennai were 84/6 in 13 overs at this stage. Mustafiz came back. With the old ball, his cutters become even more difficult to play. But Bravo decided to have a blind swing and fortunately finds an edge to take a boundary. Later, Harbhajan too threw his bat at a wide delivery and with a little help from McClenaghan in the deep gets a four. Chennai collected 13 runs and reached 97/6. Chennai lost another wicket in the 15th over with Harbhajan getting out at third man off the bowling of McClenaghan. It was a strange way to lose his wicket as his shot resembled more like tennis forehand than a slash. Mumbai took it with both hands. Chennai slumped to 106/7 in 15 overs but Bravo held fort and got boundaries. Hardik Pandya, despite not bowling at full tilt, proved really effective for Rohit Sharma. Like Shardul Thakur, he too has developed the knuckle ball and brought into full use. Mixing up his length well, he had only given three runs before he added another scalp to his figures. Raina made room for himself but failed to middle the pull. He lobbed the ball to mid-on and Krunal Pandya did the rest. Not just that, Chennai was stung by another wicket in the next over. It was the young debutant Mayank Markande, who had dream start. Bowled two dot balls and floated in a googly to Rayudu. He went for the slog sweep but the ball dipped and hit him flush in front. He was given out. Markande bowled a 2-run over and Chennai were in trouble with thala Dhoni and Kedar Jadhav on the crease. Chennai 44/3 in 7 overs. This was good captaincy from Rohit as he wanted his best over to bowl against Jadhav. It showed he wanted wickets. This was becoming a tall climb for Chennai. And oh boy, Mumbai hit the jackpot. MS Dhoni trapped by Markande now. His googly was getting difficult to read. Both wickets came through googlies. Also, in the last over, Jadhav too got hit on the pads but Rohit wasn't convinced to go for the review. Replays showed it was out too. Markande must be delighted and wouldn't have believed his luck. He's got Dhoni. Well Bowled lad. Chennai in trouble, big trouble. 51/4 in 8.3 overs. Markande had figures of 2-0-4-2. Hardik Pandya bowled another tidy over to restrict Chennai to 56/4 in 10 overs. Chennai would want to get a start and Mumbai thought how to make their chase troublesome. While Dhoni went for wickets in the first six, Rohit looked more defensive. Mitchell McClenaghan started well but Ambati Rayudu stepped out on the last ball of the first over to smoke him over mid-off for a four. Next up, it was Mustafizur Rehaman. Now Shane Watson began with a boundary over cover but Mustafiz made amends and landed his slower cutters perfectly. But again, on the last ball, as he bowled with a scrambled seam and added yards, Rayudu bent into his strike and placed it beautifully through cover from another boundary. Chennai were 16 in 2 overs. Rohit brought in Jasprit Bumrah to save runs. Bumrah, as expected was on the money right away and finished a brilliant four-run over. Then came Hardik Pandya. After the ankle twist, it wasn't expected that he will field but he made a comeback. Began well with two good deliveries but bowled the third fuller and Watson lofted it over mid-off for a maximum. Next ball, Hardik executed a knuckle ball and deceived Watson. The flick went high in the night sky and was pouched safely by deep square-leg. Chennai lost their first wicket on 27. No problems as Rayudu looked in a devastating mood. He once again hit a beautiful cover drive for a boundary to end the fourth over. Chennai 31/1 in four overs. Suresh Raina walked in. And Rohit brought in McClenaghan. Rohit wanted his quick bowlers to operate when Raina batted. But those bowlers are food for Rayudu as he made room and dispatched that short and quick ball through cover-point for a boundary. Immediately. Rohit told his bowler to keep it tight against Rayudu as anything wise he creamed for runs. Anyway Chennai reach 39/1 in five overs. Krunal Pandya you beauty. Despite Bravo bowling a brilliant four-run over, he knew that waiting game will benefit him. As Wood came in to bowl the 17th over, he nearly anticipated the slower and picked up a six off the first ball. Then he moved across and pulled/flicked another short delivery for a boundary through fine-leg. And then when he knew that Wood will aim his block hole, he moved towards leg and placed the ball beautifully through cover for another boundary. A piece of advice here. This is not an easy wicket to bat on. As much as was expected that the ball will come on to the bat nicely, its still holding up. Doesn't look like 170 like wicket. Anyway, Bravo is having fun out there. Bowled a four-run over and followed that up with a 3-run one. Amazing bowling that as he mixed up his speed and length. He deceived the Pandya brothers with his guile and also surprised them with wide yorkers. Dhoni knows he can't get back his spinners at this stage but Wood was no answer. Bowled a yorker to Krunal and he dispatches it past mid-off for a four. The next one was even a notch better. Wood bowled a quick delivery full in his radar and Krunal just smokes it down the line for another boundary. I have been saying it for a long time but he could be the real deal as fas as spin all-rounder is concerned for India. Wraps up the over with a pull for a hugeeeeee six!!!!!. Swivels in the crease and hooks it to perfection. Mumbai enjoying as they reach 160/4 in 19 overs. Bravo bowled the final over. Krunal, who was batting on 40 then got a single on the second ball. Bravo surprised Hardik with a toe crusher literally. That was quick and was accurate making Hardik to fall on to ground. This is exceptional bowling by the Caribbean and that is why he is such a dangerous asset in T20s. We might see Hardik not turning up in the Chennai's innings as he slipped on the last ball on the non-striker's end and twisted his ankle. It looks bad. Mumbai though reached 165/4 in 20 overs. Mumbai needed overs like the 11th over. Ishan Kishan belted Imran Tahir and Mumbai collected 18 off it. The Jharkhand youngster showed a mix of strength and placement to get a couple of boundaries and a six in the first three deliveries. Tahir was a little unfortunate as Dwayne Bravo misfielded in the deep for the first boundary. After that Kishan broke loose. If Kishan showed intent in the 11th, Yadav followed suit and collected three boundaries in three balls of the 12th over. Though, this time even Bravo was a little unfortunate as Ravindra Jadeja fluffed Yadav at mid-off to concede a boundary. With that Mumbai collected another 14-run over. They were 97/2 in 12 overs. Dhoni had to think quickly as he couldn't have continued with either of the two bowlers previously used. So he brought in Watson. The Aussie rolled his fingers over the ball in a bid to reduce the speed. While the Mumbai batters took him for granted and hoped for normal bowling but Watson bent his back well and produced a quick bouncer that Yadav miscued. He was caught at deep square-leg. The big partnership was broken. Dhoni was delighted and so was Watson. He had picked two important wickets. With Hardik Pandya in, Wood was given the ball. But his knack of pitching it short hurt his own cause as Pandya showed clever approach and only ramped his twice for boundaries in the back V. Mumbai got 11 runs and reached 112/3 in 14 overs. And that is what Mumbai did not want at this stage. Yes, there was desperation to put up a big score but wrong shot selection has cost them dear. Imran Tahir was brought in. He bowled two good balls to Pandya and onceKishan got the strike, he premeditatedly went for a slog sweep only to see the ball lobbing off the leading edge. He was caught at third man. Tahir was ecstatic. Mumbai went silent. Krunal Pandya joined brother Hardik and he opened his account with a crunching cover drive. Mumbai were 117/4 in 15 overs. Chennai had clinched the early advantage. Mumbai needed quick scoring but they knew they could not afford any more wickets. Dhoni brought experienced Harbhajan Singh into the attack. The turbanator produced a brilliant 4 run over, mixing up well and varying his speed. The best thing that youngsters could learn from Harbhajan is that how he bowls according to his field. To Kishan he made sure he kept it within the corridor and to Yadav, he aimed the middle stump line. Also, he knew there wasn't much turn in the pitch and only slow bowling could help him. From the other end, Ravindra Jadeja took to bowling. But even though having a lot of experience, he wasn't effective and bowled wide. The line benefitted Kishan immensely as he stuck him for a couple of boundaries, one through cover and one guided cleverly through third man. Harbhajan bowled another over and conceded 10 in it. Only once did he try to bowl it faster and was hit through the line for a boundary through cover by Yadav. He finished the rest of the over smartly. Then came England pacer Mark Wood, who surprised the Mumbai pair with his pace. Conceded just three in the tenth over and Mumbai were 65/2. A fresh wicket with a heavy grass cover. A Wankhede Stadium pitch, known for its bounce. Any captain not just MS Dhoni, would want to have a bowl first on that deck. No matter, if you don't have big bowling names in your ranks and bowlers who are not express fast, the movement can put any opposition under pressure. For defending champions Mumbai, this is not what they were hoping for. But when he was asked to bat, Mumbai skipper Rohit Sharma too admitted that some application will be prudent on this wicket. He said it in words but his actions belied his comments. After getting beaten on a banana-outswinger by Deepak Chahar, he stepped out the next one to show intent but was terribly away from the ball. Beaten. Next ball beaten again. Then Rohit stayed in his crease and placed an uppish delivery through cover for a boundary. Chahar though continued to hit the right areas and conceded just 5 of the first over. Then came Shane Watson. He too got movement off the pitch and troubled Rohit. In desperation to post a healthy powerplay total, Rohit began jumping out again but to no avail. He hoicked one in the deep but could only get a couple and Watson finished the second over brilliantly. Came Chahar again. Bowled an inswinger to Ewin Lewis. Trapped him in front. Umpire raised the finger but Lewis called for the League's first review. It's umpire's call which is indicated on the big screen and the ball was seen kissing the leg stump. In walked Ishan Kishan, who like Rohit stepped out the first ball and got a couple. But Chahar stuck to his line and gave just five runs of the third over. Mumbai were 12/1 in 3 overs. Rohit was getting frustrated and why wouldn't he as all his square cuts were blocked. So he took a chance again and found luck as he lofted Watson over cover for a six. Rohit would have thought that Watson would change his line but the Aussie bowled up and Rohit went for another hoick, only to find the ball ballooning up on his head. Mumbai 22/2 in 4 overs. Suryakumar Yadav walked in and showed maturity as he spent some time to see how the wicket played. But the moment Chahar pitched a little short, Yadav produced a copybook back foot punch, simply beautiful. Yadav then took on the offensive in the sixth over as he got 13 off Watson's over, including a back foot punch, mind you better than the previous one and then a flick for a six. Mumbai reached 39/2.